« Fast Cars? Food? Shopping? I’m In! For me, as for many travellers, food is the fastest way to learn about a new country: culture, language, history, geography and even economics are all expressed through the kitchen and then on the plate. So when landing somewhere new, I try to book a cooking class early on, preferably one that includes a market or shopping tour. In my first month in San Miguel as a visitor, I tore through most of the local Mexican cooking schools, and so have a decent mastery of market Spanish and several versions of salsa roja and verde. But when we moved here for part of the year (that would be the cold part back in Canada) I began to crave a different experience. 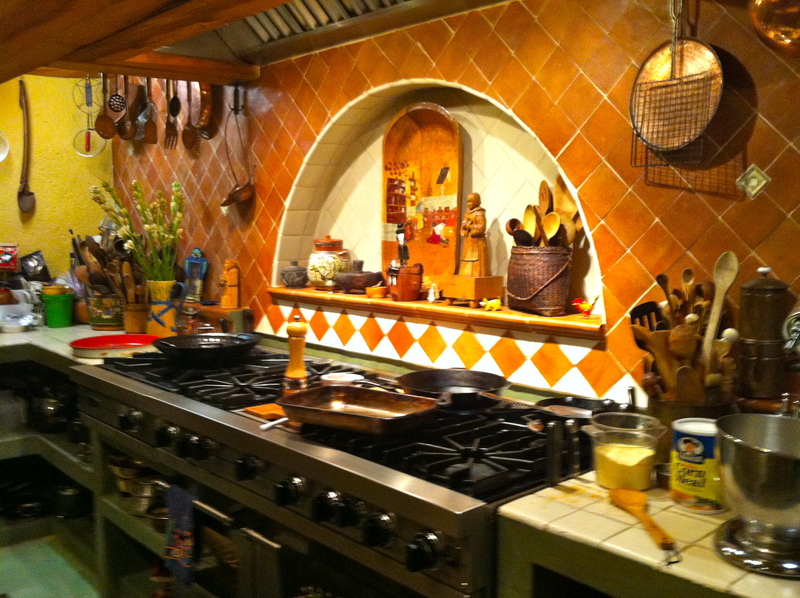 Mexican cooking is very regional, so once you have been exposed to the local specialities, you are pretty much done. Most of the Mexican classes are filled with tourists, so I was unlikely to extend my network of “like minded” residents in my new home. (Definition of “like minded”: folks who get nervous if their meals are not planned four to six sittings ahead) For six months of the year, I also craved the flavours of my favourite ethnic foods: Thai, Korean, Vietnamese, Cantonese and Sichuan. There are not many good ethnic restaurants here, I thought I might put those Far East cooking classes to work. But where to get the ingredients? I have taken quite a few classes from them, (Thai, Vietnamese,Korean , Low Country and more) and they are great fun and very social events. 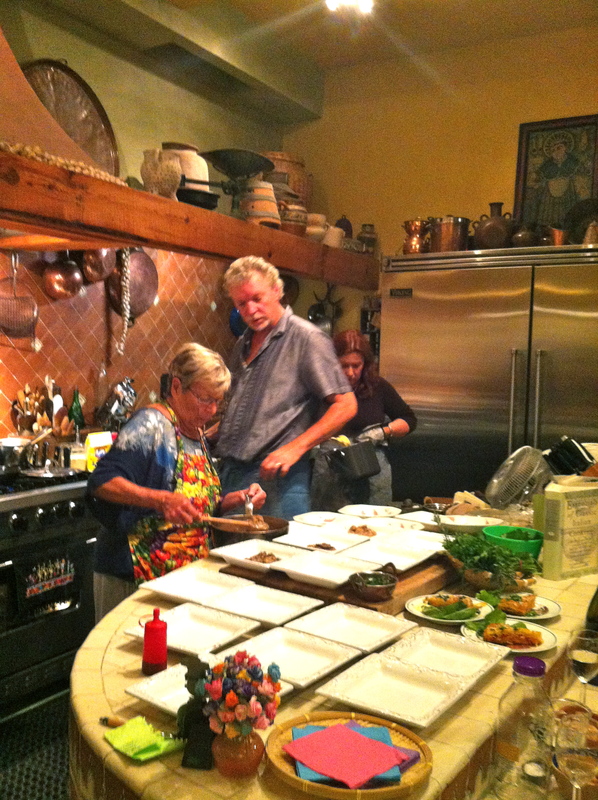 With Michael as chef/teacher and Valarie as charming and welcoming hostess, he manages to impart culinary knowledge while ensuring that we are all engaged and participating at whatever level we feel most comfortable. For some, that’s just sipping an agua fresca but if you want to, don an apron and grab a ladle. Sims) know where to get everything to do with food. From the best sources for free range chicken to what specific aisle and shelf the kosher salt is on at the local superstore, to what Asian ingredients are available where and which have to be ordered through Amazon, they are an encyclopedic culinary resource. ( Next month, expect my post on local sourcing of ingredients) Michael is also an obsessive collector of cookbooks: I think that the living room ceiling threatens to collapse under the weight of his collection above. Here is one of my favourite moments: he was giving us a tour of the rooftop garden, and walking by a container, casually pulled out a stalk for each of us and said “here’s some lemon grass, take it home, put it in a bucket, water well, and it will grow like a weed”. Like all true cooks, he loves to share his passion. And yes, she always cooked with extra virgin olive oil! Ben’s favourite course of the evening was the “Grilled Portobello Mushrooms & Polenta and Michael kindly supplied his recipe here. 1. Heat milk to a simmer in a pan. 2. Gradually whisk in the cornmeal, and cook over medium heat, stirring, until liquid is absorbed and the consistency is quite thick, about 15 to 20 minutes. 3. Turn off the heat and add the mascarpone, Parmesan cheese, and chopped herbs. 4. Add salt and pepper to taste. Cover and keep in a warm place. 1. Wash the mushrooms and take off the stems. Set caps aside for grilling. 2. Bring the water to boiling with ½ cup of the white wine in a small saucepan. Add mushroom stems, reduce heat, and simmer for about 10 minutes. 3. In a separate small saucepan, over medium heat, cook the shallots and garlic in butter until soft in consistency. 4. Strain the liquid from the mushrooms and add to the shallot mixture. 5. Add the rest of the wine and 1 tablespoon of the balsamic vinegar. 6. Add the cornstarch mixture. Cook about 5 minutes. Stir in the cream. 7. Add salt and pepper to taste. Keep the sauce warmed on the side. 1. Cut Portobello mushrooms caps in half and season with salt and pepper. Brush with olive oil and grill on both sides over medium-high heat until tender. 2. While mushrooms are grilling, cook remaining balsamic vinegar in a small saucepan for about 5 minutes, until it thickens enough to coat the back of a spoon. 1. 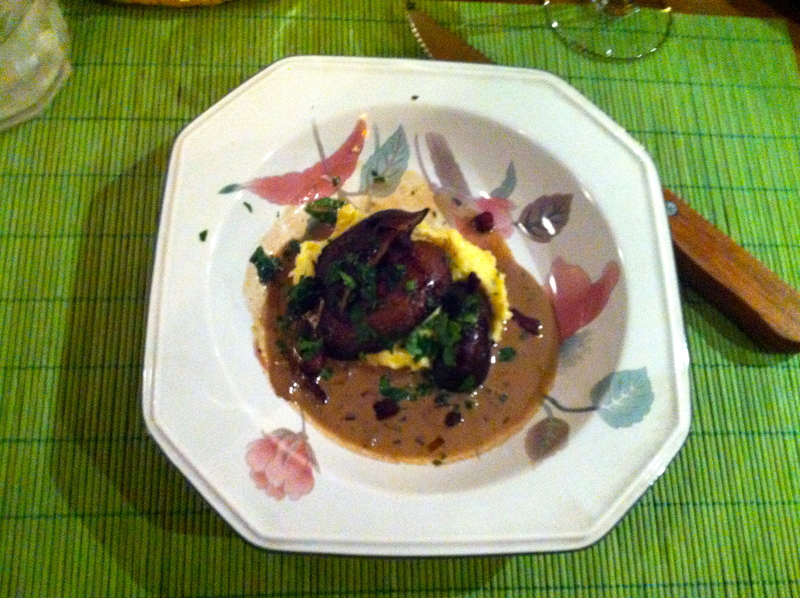 Place a scoop of Polenta in the center of each plate. 3. Ladle Shallot Sauce over the Grilled Mushrooms and Polenta, then garnish with freshly shaved Parmesan cheese and a drizzle of the balsamic vinegar reduction.